Sovereign Books Ltd is delighted to announce publication of a new book which brings the concepts of Shadow, Shadow Work, Archetypes and Emotional Healing to a new generation of men and women. Designed and written for a 21st century audience, Warrior, Magician, Lover, King offers an updated description of the male archetypes in a way that suits our times and our lifestyle. 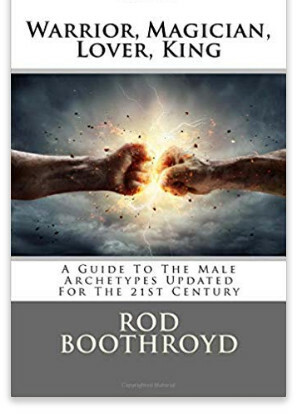 This engaging book is presented for a new generation of men and their partners who want to understand the nature of masculinity in our world today. The tools and techniques of emotional healing explained in the book, such as Shadow Work and Emotional Process Work, will allow every man who wants to embody the mature masculine to be all that he can be in his world: a mature father, husband, partner, son. A man in his fullness. The kind of man the world needs today. I read this book from cover to cover in one sitting. All those things I’d never understood about my feelings suddenly seemed clear. I had the misfortune to attend a school where physical punishment was commonplace, and it massively affected me and has impacted my life to this day. In archetypal languauge, my King archetype was completely crushed. (I found the description of men’s archetypes is fascinating – it explains a lot for me!) I’m now excited – finding this book could be the first step in finally getting over this! I understand exactly why my life has been the way it has, and now I plan to do some personal work on my emotional wounds. A wonderful book both for gaining insight and doing something constructive to make the future better than the past! I’ve attended a weekend workshop with Rod and can see he has a deep understanding of the 4 archetypal energies and their link to shadow. I’ve bought this book to find out everything that he knows about shadow to aid me on my path to becoming a shadow work facilitator. I am a men’s coach myself and I am very familiar with the model of the 4 archetypes. In Rod’s book his explanation of these energies, how they apply to the lives of men, and how to work with shadow is outstanding. Others have complicated this simple model. Yet Rod writes in a way that is easy to understand. Rod’s knowledge and advice is based on sound theoretical understanding and deep experiential work both on his own wounds and also in coaching hundreds of men over his career. I would recommend this book to all men. I’m almost finished this book and I’ve really enjoyed it. The conversational, down-to-earth style makes it very accessible. It’s packed with useful nuggets and processes to support the theory of this map of the male psyche. I run a men’s circle and have recommended it to my group. Great book!